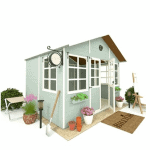 The Shedlands Traditional Stowe Summerhouse is a fantastic compact sized corner summer house that is just perfect for people who want a summerhouse, but do not have a lot of space. The summerhouse has a great look to it. It manages to have a somewhat modern design, but with classic features such as the Georgian style windows and the antique fixtures on the doors. It has a very smooth and sleek appearance and it is something that is sure to get a lot of attention from your friends and family. 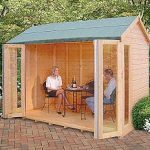 Even though this is a compact sized summerhouse it still offers plenty of headroom so even people who are over 6 feet tall will be comfortable inside here. 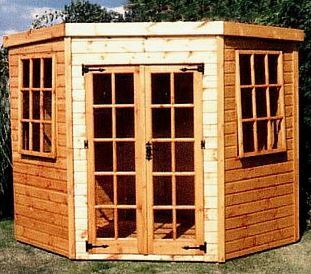 Made with high quality Scandinavian pine, this summerhouse is incredibly well made. It boasts 12 mm thick tongue and groove cladding that as well as being strong will keep every drop of rain out. Connected to this is a thick and round edged frame that ensures the summerhouse stays strong for many, many years. Tongue and groove boarding has been used for both the roof and the floor so inside the summerhouse it has a very smart look and is also very strong. Here we have the Shedlands Traditional Stowe Summerhouse, which is a lovely compact sized corner summer house that is perfect for those of you who want a place to relax, but do not have a huge garden. We would all love to have a monster of a summerhouse to kick back in our gardens, but the fact is not all of us are lucky to have the space. Well at 6 feet wide and 6 feet deep this gives you a little area to relax in even if you do not have a large garden. Upwards though this is quite the impressive specimen as at its peak it is 6 feet 9 inches and even at the eaves it is 6 feet 4 inches. So even those of you who are really tall will be able to walk around comfortably. We have seen many corner summer houses that go for a conical or an apex style roof, so to see one with a pent style roof was quite refreshing. The pent roof slopes towards the back which we really like as the rain will run off at the back and not where the door is. The roof is made with 12 mm thick tongue and groove boards which look fantastic, but they are also very strong and those along with the felt that covers them can take the weight of even the most brutal snowstorm that falls upon it. The cladding that they used for the Shedlands Traditional Stowe Summerhouse is something we really like. It is made with Scandinavian pine and done in a tongue and groove style so as well as being strong there is not little cracks, nooks or crannies that the rain can get in through. They have not cheaped out here at all as they have made the cladding a very impressive and respectable 12 mm thick. Also the cladding has this really smooth and sleek look to it that we think is just incredible. The cladding on its own is very strong and you could probably just slap that together then it would be fine. But that is not good enough for this. They have put inside a round edged, 44 mm x 27 mm frame that is very well made. This frame is very robust and that along with that solid Scandinavian pine cladding makes this one of the strongest summerhouses you will ever see. Or if seeing is not enough, you can give it a whack and your sore hand will let you know just how strong this is. The inside of this corner summer house looks great. We already said how great the tongue and groove boarding on the roof looks and this same boarding is used for the floor as well. We must say we really like this as it gives the inside a very uniform look. It makes the whole inside have a very smooth look. The floor though is also very strong as it is 12 mm thick and supported with some great floor joists. You can pretty much put whatever you want in here and the floor will not show any signs of weakness. You are going to have to treat the wood once you have installed the summerhouse. The Scandinavian pine looks so great that we highly recommend you do it within a week of installation. Once a year, you will need to give it another coating of wood treatment in order to really keep that pine looking smooth and free from rot. 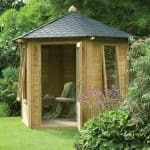 The Shedlands Traditional Stowe Summerhouse has a one year warranty that will protect you just in case there is a problem with some of the materials. Sure we would like to have seen a longer warranty, but this is well made so we do not see you running into any problems. We were very impressed to see that even though this is what we would class as a small corner summer house, double doors have been used. These doors have some truly incredible frame work and are finished off with some antique style hinges. The doors when open offer 5 feet 8 inches of height and 3 feet 6 inches of width so you will have no problems getting your big TV in here. As well as the windows that make up most of the door, there are two just amazing looking Georgian style windows on the sides of the summerhouse. The windows on the Shedlands Traditional Stowe Summerhouse are made with strong horticultural glass and can even be opened so you can get a good flow of fresh air in the summerhouse. There is a key operated lock on the double doors so anything that you do place in here is not going to be easily accessible to thieves. As long as you remember to lock the summerhouse up when you are finished of course. With the front of the summerhouse being dominated by the two side windows and the large amount of windows on the doors, you do not get much privacy here. But if you do want to keep things hidden when you are not home then consider installing some blinds or curtains to keep your belongings a bit better hidden away. We love the way the Scandinavian pine looks, but if you are not a fan of the traditional wood look then you could always decide to go for a coloured wood treatment. They do not actually offer any customisation options with this corner summer house, but picking a bright or dark wood treatment is certainly one way to give it a bit more of your personality. They do list a few interesting extras with the Shedlands Traditional Stowe Summerhouse. First is an installation service which will cost you £125. 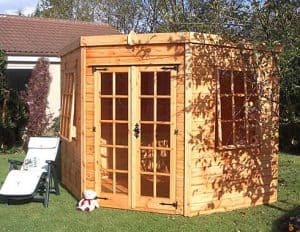 If you are a little worried about the surface you are going to be installing the summerhouse on then they do also have a set of floor bearers for £29.99. Then they have the following extras listed: fully boarded double door, 18 mm premier cladding, 18 mm floor boards, and 50 x 50 mm framing. Now these sound great, but they do not list the prices so if you are interested in any of these you will have to inquire about them when you order. 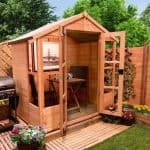 This is a summerhouse that is just high quality through and through. They really have used the very best materials they could for this and we feel that it shows in how good it looks and how strong it is. As long as you look after that Scandinavian pine, you are going to be able to enjoy this for many years. 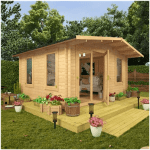 This is one of the smallest summerhouses we have seen so you are going to have to plan it out very well as there is not a whole lot of space for you to work with. 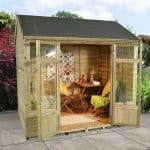 But for smaller gardens this size is just ideal as it gives you a space to relax, but it does not have a huge footprint. We do not see you having any trouble putting this together. Just be sure to have a friend who can help, some good music playing and a few bottles of coke in the fridge and you can make a fun day of this. This is quite expensive considering the size, but the materials used to make this are really top of the line in every regard. If you want the best materials then you are going to have to pay for them. Final Thoughts: We really love the Shedlands Traditional Stowe Summerhouse. It looks amazing and they really could not have used any better materials. Of course with this comes that hefty price tag, which we know sounds completely out of line considering the size. But this is a premium corner summer house and because it is made with the best materials they have to charge a price as high as this. If you can stomach the price then we are positive you are going to fall in love with this. Plus you can always maximise the space it offers very well if you are smart with how you organise it. Absolutely disgraceful customer service . Poor workmanship . The shed was installed with a vital PART MISSING that has led to repeated leaks that I have tried to seal but can’t stop the rain coming in because a vital part was omitted from installation. This shed HAS LEAKED from the first week it was installed and continues to leak. I tred to contact customer services and was refused the opportunity to talk to a manager or supervisor. Do not buy anything from this company. You will regret it. Perhaps others who have reviewed this company had their sheds properly installed but are you willing to take the risk that yours will. And know if you ever have an issue surrounding your purchase from this company ,they will blow you off and lie to you.